Childhood obesity has more serious future health implications than most parents think. Studies from University of Surrey, UK found increased arterial damage in obese children. The arterial damage aggravates the chances of that child suffering from cardiovascular disease in its adult life. 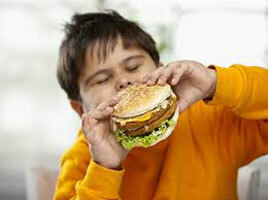 Researchers have established that obese children are more likely to develop type 2 diabetes in adulthood. Childhood BMI is also a predictor of adult hypertension, asthma, hepatic steatosis, sleep apnea and arthritis. Whereas the popular perception in Indian families is that plump child is a healthy child. Which is incorrect. Childhood obesity is something that we need to address an protect the child from unhealthy adult life with life threatening consequences. These tips may help you prevent weight gain while your child enjoys its food and eating time. Respect your child’s appetite. Human bodies right from infancy are tuned to recognise when they are full. So children do not have to finish everything on their plate, or finish the entire bottle. Do not reward completion of meals with sweet desserts. This will subconsciously script a child’s mind into believing that eating is hard work but you are rewarded for finishing it, in the end. Make his or her favourite food healthier. You don’t have to ask your child to avoid his or her favorite food. That will induce craving. Instead, the recipes that your family enjoys, with just a few changes, can be healthier and just as satisfying. For instance, if your child loves Biryani, no point in asking him or her not to eat it because Rice makes you put on weight if eaten in large quantities. Just replace the rice with dalia or broken wheat. This tastes good and is much healthier. Enjoy physical activities as a family, such as walking, swimming and playing outdoor games. Pre-school to primary school children should do three hours exercise a day once they can walk. Five to 18 year olds are encouraged to do an hour to several hours a day of moderate to vigorous intensity physical activity. Three days a week this should include vigorous intensity activities to strengthen muscle and bone. Reduce Sedentary Time: The American Academy of Pediatrics (AAP) does not recommend television viewing for children age 2 or younger. In fact TV is bad for all ages. Although quiet time for reading and homework is fine, limit the time your children watch television, play video games, or surf the web to no more than 1 hour per day. If you want to learn more about healthy diet for your child and family, you may please ask for an appointment with our Dietitian. Call us at +91 22 2888 6666. Dr Abhay Agrawal continues to be featured by US news agencies Something Stealing your Sleep?